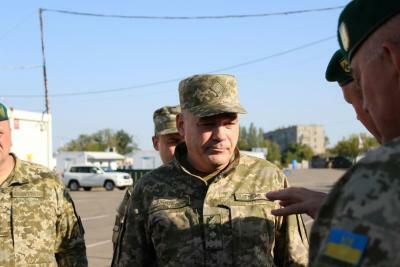 In the framework of the working trip to the border units in the ATO area, the Head of the State Border Guard Service of Ukraine Lieutenant-General Petrо Tsyhykal checked the organization of the service on the area of responsibility of the «Kramatorsk» Border Guard Detachment. At the control point of entry and exit "Mayorske" the Head of the border agency checked the service of border squads on the separation line, inspected the places of service of personnel at the control posts of the first line and communicated with travelers. Besides, the group from the Administration of the State Border Guard Service of Ukraine studies the possibility of deployment the Regional Directorate on the basis of the separate military unit "Kramatorsk"
«This would help to increase the efficiency of our units in the ATO area and the level of interaction with the Armed Forces of Ukraine and other law-enforcement agencies» - said Petro Tsyhykal. Moreover, the Head of the State Border Guard Service discussed this prospect with the Head of the Donetsk civilian-military Administration Pavel Zhebrivsky. “The Service are proud of you, the people of Ukraine are proud of you," said Petrо Tsyhykal to warriors.